This is one of my favorite photo captures from last week. This setting is SO Portland! The biker at sunset approaching the Broadway Bridge, TriMet rail, Union Station, and the rainbow of the Steel Bridge in view. I love all the intersecting lines in this piece--the train rail, crosswalks, light pole, and vapor trails. Processed this in Topax Adjust, HDR collection, mild color punch, grunge. 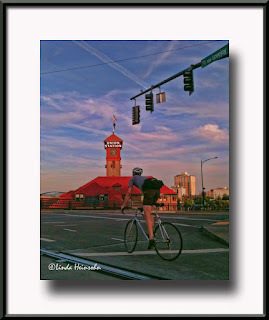 Since the biker was dark in front of the glowing train station tower, the HDR adjustment brought both foreground and background into more balance. Nice! You know what I especially appreciate about this post? The fact that YOU are so jazzed about the photo, and why. It IS a terrific shot ... For all the reasons you indicated. Amazed that I'm the first to comment on it. Woof! Thanks, Carol! I often have my camera ready with me when I'm approaching Broadway bridge because of the possibility of such a lucky shot. This time, my dream came true! Thanks so much for a fun day at SCRAP and shooting in Water Avenue district! It was a pleasure meeting you and Chris! Hoping to poke through photos I made from our shooting together soon. We got a dog today and our cats are super pissed so photos will need to wait a bit until everyone in the household calms down.